The Centre, meanwhile, has sought a recall of the March 20 judgment. New Delhi: Even as opposition parties in Tamil Nadu staged a protest against the alleged dilution of Scheduled Castes and Scheduled Tribes (Prevention of Atrocities) Act yesterday, at least thee BJP-ruled states issued instructions for strict implementation of the Supreme Court order barring any arrests under the Act without prior sanction citing “rampant misuse”, only to reverse themselves 24 hours later. The Centre, meanwhile, has sought a recall of the March 20 judgment that has drawn severe ire from victims of caste atrocities. 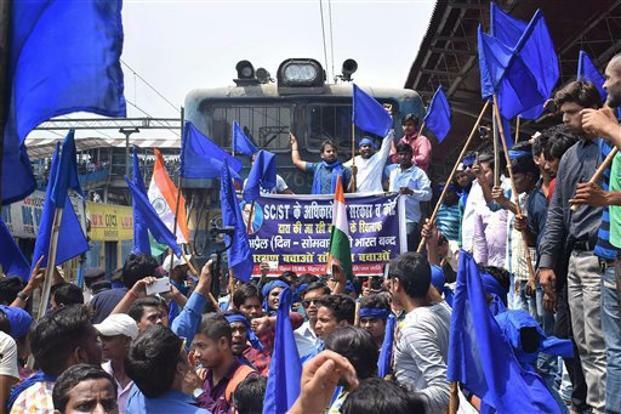 Dalit groups around the country have staged protests and a Bharat Bandh on April 2 against the ruling saw sporadic violence and left several dead. As many political parties and Dalit groups accused the apex court of failing to protect Dalit rights, the Central government was forced to approach the court with a review petition. The Centre has said the states “should not do anything by which the SC/ST Act is weakened or whittled down”. Some states ruled by the BJP, however, went ahead issuing informal instructions to implement the court order. According to Indian Express, Rajasthan and Madhya Pradesh instructed police chiefs to strictly comply with the SC order. Hours later, PTI reported that these states withdrew those instructions. While Himachal Pradesh has circulated the order informally among police officers, Haryana has sought legal advice on it. In BJP-ruled Chhattisgarh, however, just days after the police formally ordered the implementation of the SC’s amendments to the Act, the state chief minister Raman Singh said on Tuesday that the order stood suspended. “We have always been sensitive towards the cause of SCs & STs, however, state government, just like Centre, will appeal against decision of Supreme Court. Till then the order [to strictly implement the Supreme Court order] by police headquarters stands cancelled,” Singh was quoted as saying by ANI. In Congress-ruled Karnataka, which is set to go to polls next month, the order has been circulated informally. The state welfare department of another Congress state, Punjab, has put the order-related file before its chief minister, Amarinder Singh, who according to the news report, is yet to respond. Yesterday’s protest in Tamil Nadu was led by opposition leader and Dravida Munnetra Kazhagam (DMK) working president M.K. Stalin, who demanded that the Act be included in the Ninth Schedule of the constitution. According to Livemint, he further said that the Supreme Court’s order diluting the Act was unacceptable. It’s not just opposition parties and Dalit groups, Dalit MPs and legislators within the BJP too have expressed their disquiet over the court judgment. For instance, Lok Sabha members – Savitri Bai Phule from Bahraich, Chhote Lal Kharwar from Robertsganj, Ashok Kumar Dohre from Etawah and Yashwant Singh from Nagina – believe that ‘dilution’ of the Atrocities Act has sent out the message that the ruling party is indifferent to Dalits – particularly to the reservation policy and increasing cases of atrocity on Dalits. One of the legislators even complained that the UP chief minister Adityanath did not heed their grievances when they tried raising the issue with him. Dalit minister Ram Vilas Paswan, who also heads Lok Janshakti Party, an ally of the BJP, had urged the government to file a review petition. This story has been updated with the news that Chhattisgarh, Rajasthan and Madhya Pradesh suspended the police order enforcing the Supreme Court amendments.